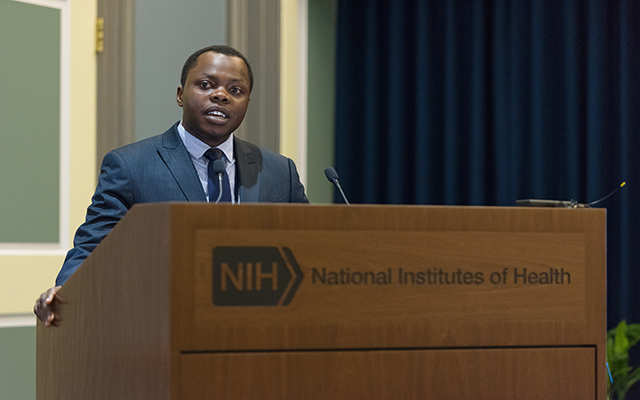 Dr. Jean Nepo Utumatwishima, the first graduate of the NIMHD-NIDDK yearlong Rwanda fellowship program, delivers his graduation presentation on the campus of NIH, June 26, 2017. Twenty-three years after the genocide that disrupted Rwanda’s fragile economic structure, Rwanda’s Ministry of Health has given Dr. Jean Nepo Utumatwishima the opportunity to travel abroad for training in medical research. Dr. Utumatwishima is the first graduate of the National Institutes of Health’s Rwanda fellowship, which serves as a yearlong program geared towards training a Rwandan physician to become a clinician scientist. “You will never get a Nobel Prize for operating on people who have a disease that can be prevented,” said Dr. Utumatwishima during an interview about his transformational experience at NIH. Those words, spoken to him by a former colleague, emphasized that disease treatment was achieving the minimum, the goal was to prevent disease from occurring. Those words would spur Dr. Utumatwishima into the mindset of public health and ultimately on the journey from Rwanda to NIH. Dr. Utumatwishima’s public health impact, however, would be seen in 2016, before his fellowship with NIH. After performing more than 600 thyroid gland surgeries to remove goiters found in Rwandan natives caused by iodine deficiency, Dr. Utumatwishima decided to shift his focus to HIV/AIDS prevention. Dr. Utumatwishima’s facility, Kinihira Provincial Hospital, started a peer-education program in which HIV-positive women taught their pregnant HIV-positive peers how to properly take their medication and adhere to doctor visits. The results from the initiative were astounding, so much so that “PBS NewsHour” covered the findings in its series “The End of AIDS?” The hospital had achieved zero cases of mother-to-child transmission of the virus, instantly making Rwanda a global anti-AIDS leader. It was during this successful work as a public health provider that Dr. Utumatwishima chose to apply for the one-year fellowship at NIH, hoping to gain skills that would help him establish a career as a public health and clinical research scientist in his country. In 2015, a chance meeting between three public health advocates sparked the idea to develop the Rwandan international fellowship program. Dr. Anne Sumner, a senior investigator at the National Institute of Diabetes and Digestive and Kidney Diseases (NIDDK), attended a lecture at NIH given by Rwanda’s then Minister of Health, Dr. Agnes Binagwaho. “The lecture was spellbinding,” said Dr. Sumner. In her talk, Dr. Binagwaho called for “research to come from big institutions in America to Africa.” She said that Rwanda was a “failed nation” after the genocide, which took place from April to July of 1994, to rebuild, the country started with immediate needs, such as a new infrastructure and health systems. She described the next step to be developing partnerships that could help fill the gap in research and build the research system. Dr. Sumner reached out to National Institute on Minority Health and Health Disparities (NIMHD) Director Dr. Eliseo J. Pérez-Stable, who was immediately interested in the program. According to Dr. Sumner, bringing the first yearlong fellowship for Rwandan physicians to NIH was a collaborative effort that NIDDK could not have achieved without the role NIMHD played and Dr. Pérez-Stable’s support. Although Dr. Sumner hopes to one day expand the international fellowship program to another country in need, for now, her focus is to make Rwanda a successful showcase. As Dr. Utumatwishima prepared for his graduation presentation, he spoke of his intent to go home to combat diabetes among his people. Dr. Utumatwishima spoke of his goal to start a research lab in Rwanda to conduct his studies, noting that he would not be able to maintain the facility alone. Luckily, his Rwandan successor, Dr. Jean Damascene Kabakambira, arrived on July 3 to begin the second yearlong fellowship just as Dr. Utumatwishima departed. 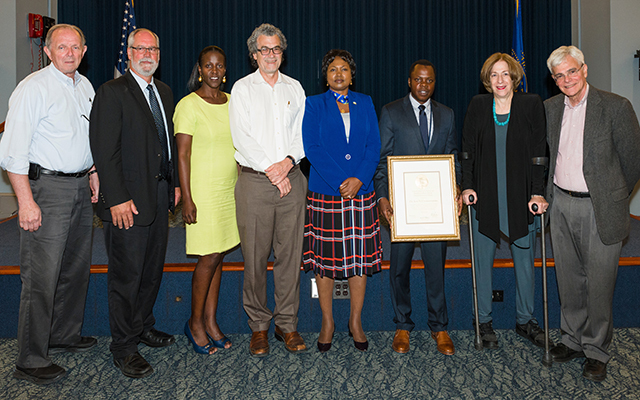 During his graduation presentation, held on the campus of NIH on June 26, 2017, Dr. Utumatwishima credited his opportunity to Dr. Sumner and Dr. Pérez-Stable, as well as thanking NIDDK Director Dr. Griffin Rodgers, NIDDK Scientific Director Dr. Michael Krause, and Fogarty International Center Director Dr. Roger Glass. Since Dr. Utumatwishima completed his fellowship, he has presented at medical conferences and engaged in clinical, administrative, and teaching positions. Dr. Utumatwishima highlighted his NIH fellowship experience at the 12th International Conference on HIV Treatment, Pathogenesis, and Prevention Research Conference. He presented on stress factors for African immigrants at the 2017 African Organization for Research and Training in Cancer Conference. In September 2018, NIMHD sponsored his attendance at the International Summit in Human Genetics and Genomics at NIH. As Director General of Ruhengeri Referral Hospital in Rwanda, Dr. Utumatwishima is studying preventable causes of maternal deaths and leading a clinical trial on a medication to treat Rwandan patients with schizophrenia. In addition, he is serving as a university lecturer in human anatomy and physiology. Dr. Utumatwishima poses for a picture with his NIH plaque and those involved with his NIH fellowship opportunity...(l-r) NIDDK Clinical Director of Intramural Research Dr. James Balow, NIDDK Scientific Director of Intramural Research Dr. Michael Krause, Dr. Margaret Udahogora from the University of Maryland, NIMHD Director Dr. Eliseo J. Pérez-Stable, Ambassador of the Republic of Rwanda Professor Mathilde Mukantabana, Dr. Jean Nepo Utumatwishima, Dr. Anne Sumner of NIDDK, and NIH Deputy Director for Intramural Research Dr. Michael Gottesman.